Get ready to hire persons with disability! Four steps to best prepare your company before hiring persons with disability. 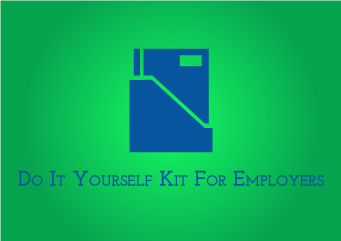 Get connected with peers or consultants or order a Do it Yourself Kit. Getting connected with peer leaders will give you access to their experiences. The leaders include CEOs, VPs to team leads from different companies and sectors who have hired people with different disabilities and have worked on inclusion, awareness, career development, accessibility, breaking barriers, inclusive policies and more. Connect with consultants who will understand your company's needs, situational context and suggest the best way forward and provide the required services. Get connected to consultants to start your actions. Order the DIY kit which includes Coffee Table book, Jobs done by persons with disability, 2 Video CDs, and Guide. This is a common question which comes from a lack of awareness. The answer is simple - Think about abilities and inabilities in people. All people have an inability to fly. But we use alternate means like planes to overcome our inabilities. Similarly, people with disability use alternate means to overcome their inabilities. Get awareness and understand the business value in hiring persons with disability and find out the steps to hire. Spread awareness in your company at all levels!! This is the first step. Order the Coffee Table Book which 1000+ managers across India, Africa, Europe and Australia are using to gain insights into the potential of persons with disability. See this 10 minute video on retail sector explaining the business value proposition and the steps for hiring persons with disability. See this 5 minute video by Fibrelink director to answer the doubt "Can small sized teams or small companies afford to hire persons with disability?" Persons with disability work by using their abilities and using workplace solutions and adjustments to overcome barriers. Hire people based on their ability. Find out the adjustments or solutions that may be required. 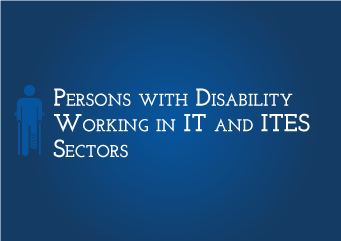 Analysis done with more than 700 companies across 26 sectors shows that persons with disability are working in 30+ functions ranging from managerial, technical, semi technical, to cash operations, inventory management to assembly, kitchen operations and more. Search for jobs in your sector or function or specific job role or for jobs being done by specific disability. Order the publication "jobs done by persons with disability" to learn about 272+ jobs being done by disabled. Order the DVD "Hiring persons with disability" and use the 10+ videos to create awareness in your company or team. 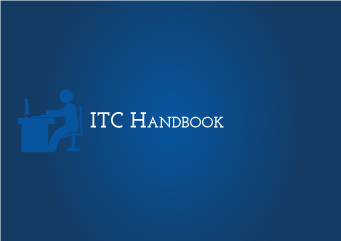 Download this step by step guide created by ITC company on hiring persons with disability. Persons with disability may use alternate solutions to overcome barriers in the work to achieve the same results. These workplace solutions may be simple aids, technology, assistive devices, or a change in process. Watch 1 minute video on communication board used by hearing impaired. These workplace solutions may be simple aids, technology, assistive devices, or a change in process. Check if your company has basic accessibility for persons with physical disability to access the work area and move around to use facilities such as restroom and pantry. The solutions may vary based on the job seeker from small workaround s to building accessible restrooms and ramps. It is important to have a three pronged approach. First, hire person with disability and make the required changes and workarounds. For example: Mphasis hired person with cerebral palsy and then made their training facility accessible. Secondly, influence builders if you have a rented premise and make the premise accessible. Thirdly make proactive changes to all your premises to make your office world class and meet global accessibility standards. Electronic accessibility enables persons with vision impairment, cerebral palsy and persons with severe multiple physical disability to work effectively. You can test software applications proactively or after hiring the disabled person. Many organizations use online leave management systems and attendance systems. 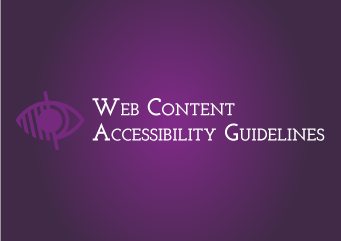 Whilst it is a good practice to make this accessible for visually impaired, this is not a must if you have suitable workarounds in the initial phases. Over a period of time, the applications can be made accessible with proper planning and priority. 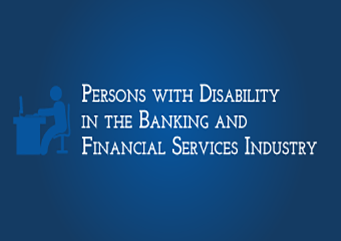 "Where do I find suitable persons with disability? " Get started by reaching out to NGOs and other service providers who provide training, placement and support services. Some work across India, others work in local areas. Some specialize in events such as job fairs and more. Find suitable service providers to get started. 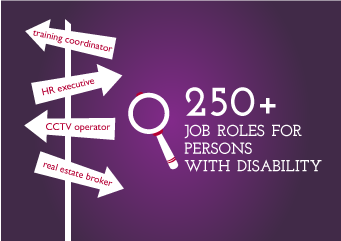 In the long run, hiring persons with disability through multiple channels is the best option. Download a resource to help you interview persons with disability effectively! Focus on trying to keep the interview as close to what you would normally do as possible. It's completely acceptable to ask difficult questions, or focus on problem areas, as long as you would do that in interviews for non-disabled. Allow a little extra time to understand how to work with sign language translators. Interviewing persons with disability can be a challenge for recruiters because it may need some work to understand what questions to ask to find the match. What if there are performance issues with person with disability? This apprehension is common and understandable. However, it is important for leaders to hire the right person with disability and provide a level playing field by providing solutions and right environment. It is also important for leaders to give right amount of work and to provide timely feedback for employees with disability. If there are performance issues, do the due diligence required. Additionally, see if the issues are related to lack of inclusion, lack of support, lack of work and more. The most inclusive companies have been fair to all employees and follow standard HR policies. 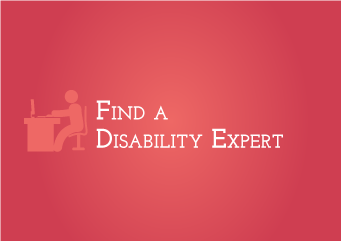 How do I know which disability type I can hire? Some aspects of deciding which disability type to hire from it is common sense and easy to understand (for instance, persons with hearing impairment will not be able to work in call centres, etc.). For more complex decisions, conduct job analysis and get a thorough understanding of any limitations of the role. My office is not accessible. How can I hire persons with disability? It is more important to focus on hiring diversity and providing inclusive environment. Companies that hire and include employees send a powerful message regarding their core values that we value and enable all our employees. Please note: premise accessibility such as ramps is required primarily for persons with disability who use aids such as crutches, walkers or wheelchairs and not for other disabilities.